For situations where input data and output data is relatively small, this poses absolutely no issue - and I’d argue these are probably the most common cases. However - what if your async addon is going to do a lot of computation over a large input? What if it generates a huge amount of data? Note that in the figure above - copying input and output data is being done in the event loop - meaning if it takes a long time, we’re blocking the event loop (which we hate doing!). Copying data might take long, which ties up the Node.js event loop. As mentioned above - this is something that the official Node.js and V8 documentation both specifically say we can’t do… however I think it’s instructive to see why (and documentation covering the “why” is hard to come by!). The remainder of this post is about how I went about proving to myself it wouldn’t work, and the ways I’d recommend mitigating the problem of copying within the event loop. Warning: most of this post contains anti-patterns for asynchronous addons with Node.js. I’m attempting to illustrate the details of why we must work with libuv and always access V8 data from the event loop - as is outlined in the posts I linked to above. 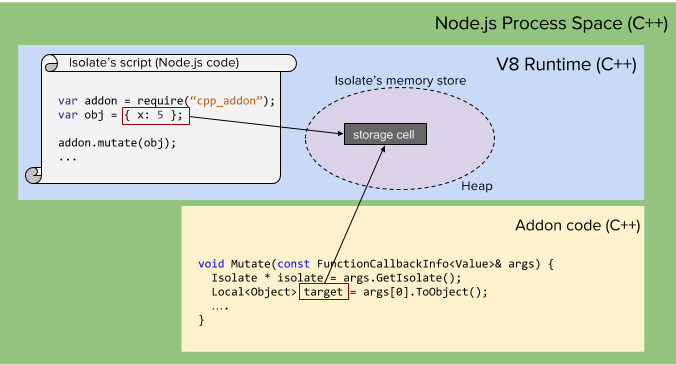 As you can see from the diagram, the Local<Object> handle we create (target) will allow us to access V8 storage cells. Local handles only remain valid while the HandleScope object active when they are created is in scope. The V8 Embedder’s Guide is once again the primary place to learn about HandleScope objects - however put simply, they are containers for handles. At a given time, only one HandleScope is active within V8 (or more specifically, a V8 Isolate). Where’s the HandleScope in the above example? Good question! Are Persistent handles the answer? Maybe! As the name implies, Persistent handles are not automatically destroyed using HandleScopes - they can hang around indefinitely. Once you’ve created a persistent handle in your C++ code, V8 will honor that reference (and make sure you can still access the storage cells it points to) until you explicitly release it (you do this by calling the handle’s Reset method). At first glance, this appears to be precisely the tool that would allow a long-lived C++ worker thread to access V8 data. // Stays in scope the entire time the addon is loaded. If you are unfamiliar with building addons, a tutorial about the build tool (node-gyp) and the details of how to set it up can be found here. The second function exposed by the addon is Mutate, and it simply adds 42 to target’s only property - x. Now let’s look at the calling Node.js program. When we run this program we’ll see obj.x is initially 0, then 42, and then 84 when printed out. Living proof we can hang on to V8 within our addon across invocations… we’re on to something! Bring on the worker threads! If you’ve tried this before, you know what’s coming next! Lovely. It turns out V8 doesn’t allow what we’re trying to do. Specifically, a single V8 instance (represented by an Isolate) can never be accessed by two threads. That is unless, of course, we use the built in V8 synchronization facilities in the form of v8::Locker. By using v8::Locker, we can prove to the V8 isolate that we are switching between threads - but that we never allow simultaneous access from multiple threads. Viewing V8 isolate as a shared resource, anyone familiar with thread synchronization can easily understand v8::Locker through the lens of a typical synchronization primitive in C++ - such as a mutex. The v8::Locker object is a lock, and we use RAII to use it. Specifically, the creation of a v8::Locker object (constructor) automatically blocks and waits until no other thread is within the isolate. Destruction of the v8::Locker (when it goes out of scope) automatically releases the lock - allowing other threads to enter. At this point, since we haven’t added locking anywhere else, you might think this would have very little effect if we run our program now. After all, there is seemingly no contention on the V8 lock, since the the worker is the only thread trying to lock it. This is not what we see though… instead, we see that our worker thread never acquires the lock!. This implies our event loop thread owns the isolate. Diving into the Node.js source code, we can see this is correct!. Inside the StartNodeInstance method in src/node.cc (at time of this writing, around line 4096), a Locker object is created about 20 lines or so before beginning to process the main message pumping loop that drives every Node.js program. Node.js acquires the isolate lock before beginning the main event loop - and it never relinquishes it. This is where we might begin to realize our goal of accessing V8 data from a worker thread is impractical with Node.js. In other V8 programs, you might very well allow workflows like this, however Node.js specifically disallows multithreaded access by holding the isolate’s lock throughout the entire lifetime of your program. As you can see - this does work - we an access V8 data from a worker thread while the event loop is asleep, with an Unlocker in scope. If you’ve written async addons in C++ already, you surely have used Persistent handles to callbacks. You’ve gone through the trouble of copying input data into plain old C++ variables, used libuv or Nan’s wrappers to queue up a work object to be processed in a worker thread, and then copied the data back to V8 handles and invoked a callback. If you haven’t done this - read this now, so you understand what I’m talking about. Once you understand the threading rules, I think the elegance of the typical async solution pattern becomes a lot more clear. Hopefully this post has made it a little more clear why multi-threaded, asynchronous addons written for Node.js should follow the types of design patterns outlined here and here. In summary, asynchronous addons must always access V8 storage cells from the Node.js event loop thread, and not their worker threads. This unfortunately means you’ll need to copy data out of V8 to work on it in your worker threads, and then copy result data back when the job is complete.